We are thrilled to have Lisa on the blog today from Notes from a Mad Housewife. She is one of our favorite sewing bloggers and when we got in some new rayon challis, we couldn't wait to ask her to make something with one of the prints. We're so lucky she agreed! A little about me... I grew up watching my mom sew, and even though I didn't do much sewing myself as a kid, I absorbed just enough to get me started when I got my own machine. Initially my sewing was for things like halloween costumes and dresses for my girls. Then about three years ago it dawned on me that I could sew actual clothes for myself and I've hardly bought a piece of clothing since. I'm married and have four young children, so in addition to sewing my wardrobe I've started working on my husband's, as well as supplementing my kids' closets . I'm interested in functional everyday pieces that get worn on a regular basis, not just the fluffy dresses (though that's fun too!). Julie over at Fabric Mart contacted me a while back asking me to guest post for their store blog. No need to ask twice! 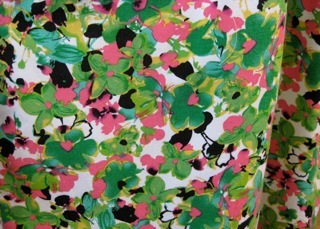 She pointed me to some rayons and I immediately fell for a green and pink floral print. As quickly as I picked my fabric I knew what pattern I wanted. 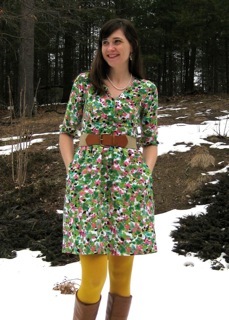 I've drooled for ages over Megan Nielson's darling ranges dress and knew they would be a perfect match. Seriously, sometimes you agonize over these decisions for days, months, years... and sometimes you know in an instant what you want. I traced off the bodice and knew right away it would take a bit of modifying to get a good fit. I'm no fitting expert but I know if a dart intake is more than 2" i will definitely need to do a SBA. 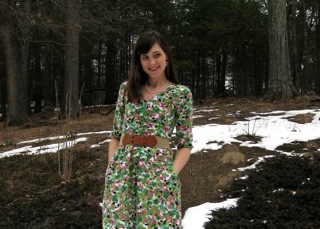 Yay for megan's great blog (and her darling ranges sew-a-long!) because she has all the directions for bust adjustments. After the SBA I still wasn't sure this was going to 100% fit me, so I decided to muslin the bodice. I knew I wanted darts in the back at the waist instead of ties and I've seen people make bodice length adjustments, so I wanted to test it all out first. sheesh! I'm such a fitting mess sometimes! Just so you know, I'm not crazy about fitting a garment within an inch of it's life, but I have become attune to where I need adjustments. The fit of this bodice was swinging to the back on me (I have a slight forward shoulder), and i knew it would end up uncomfortable and fidgety. I guess if you have the arrow straight back of a ballerina you'd be fine. I don't. also, I'm on the tall side (5'8") but the top quarter of me is actually petite. basically I'm a petite tall with a forward shoulder. Try finding that in RTW! I pinned out 3/4" horizontally for a petite adjustment and that immediately made a huge difference. The other adjustments I listed were mere tweaks to get the perfect fit. So glad I decided to muslin this one! I transfered the adjustments and I was ready to go. The sewing itself was pretty straightforward and easy. I'm particularly enamored with the pockets and neckline finish. It's not like this is my first inseam pocket, but she does it in a manner I haven't seen before. You attach the pocket bags with a 1/2" SA then sew up the whole side seam and pocket bag in one go with the regular 5/8" SA. The pocket seam is recessed slightly so you don't have to worry about all those dots and crazy markings lining up just so. And really one of the things I liked so much about this pattern is that there are not excessive pattern markings. She simply says to measure down 3" from the waist and attach the pockets there. who needs all those crazy dots?! The neckline also is pure genius. I've done bias facing many times, and here it just disappears into the folded over button placket. No awkward corners to navigate. I am completely in love with this dress, and the fabric I used is so soft and comfortable, I know it will be a favorite. Rayon can be an unruly beast to work with, but the payoff is worth the hassle. Also, this is the first Megan Nielson pattern I've done and even though the design is fairly simple, I am super impressed. On her blog she once wrote that she wears all her designs before issuing a pattern and is particularly committed to her patterns being wearable for everyday. If it's not comfortable for daily wear it gets the boot. Smart lady! I'm pretty sure I'll be making a few more darling ranges (as well as picking up more of her patterns) because that is exactly the philosophy I apply to my own sewing. Big thanks to Fabric Mart for featuring me! p.s. If you want more information about the pattern adjustments I made, please check out my blog! They are great for everyday dresses and flowy tops! And they come in wonderful prints that are bold and fun! 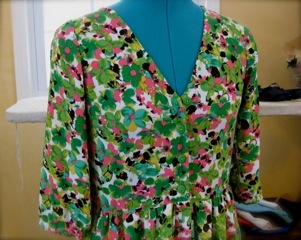 Have you tried sewing with rayon challis?